The initial extent of the winemaking on this 2,000 acre apple orchard included 20 acres of grape vines and a production facility in existing farm buildings. Subsequently a concrete structure was buried at the edge of a bluff for barrel storage. 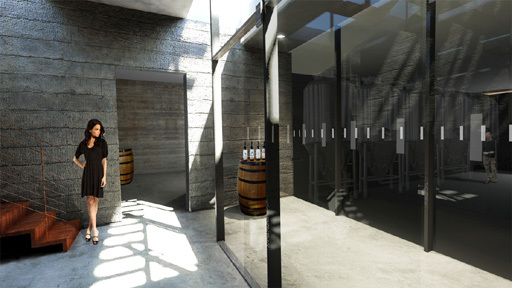 Our design for the winery was to relocate the production facilities into a building uniquely designed to merge with the barrel cave. The new facilities surround two sides of the subterranean space, and accommodate a system for gravity flow. At grade we have provided a crush pad with multiple orifices above the tanks below, a glazed enclosure for public entry into the facility, and a light weight canopy to provide shading and support of a photovoltaic array. 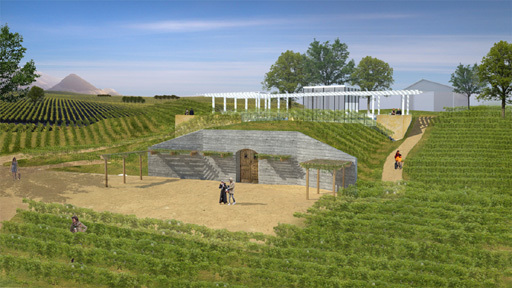 The on-grade structures also act as the identifying element of the winery as viewed from the main road through the valley. Below the chrus pad is and intermediate level containing fermentation tanks and a VIP tasting room. This level has several large openings into the existing barrel room providing functional flexibility. Light wells provide natural light into all subterranean levels.